South Korea’s Animal Protection Law is a joke. Look at these dogs, brutally bludgeoned with a hammer and stabbed in the neck with a knife and agonizingly bleeding to death. How are they being protected? Terrified dogs in cages right next to the slaughterhouse can see and hear them being killed. What law is protecting them? South Korea’s dog meat market is disgusting and cruel; when will it end? How much longer will Koreans ignore the cries for help and mercy from these poor animals? Next time you are thinking about buying Korean products such as Samsung, Hyundai, LG, Kia, remember the cries of man’s best friend. Do not support Korea’s economy until they stop this abomination! It was reported on August 16, 2016, by KBS News and Kukje News, and again on August 17 by TV Chosun News, that the butcher of a dog slaughterhouse in Ulsan, Namgu District Sanggae-dong that has been brutally slaughtering and selling dogs has been caught. 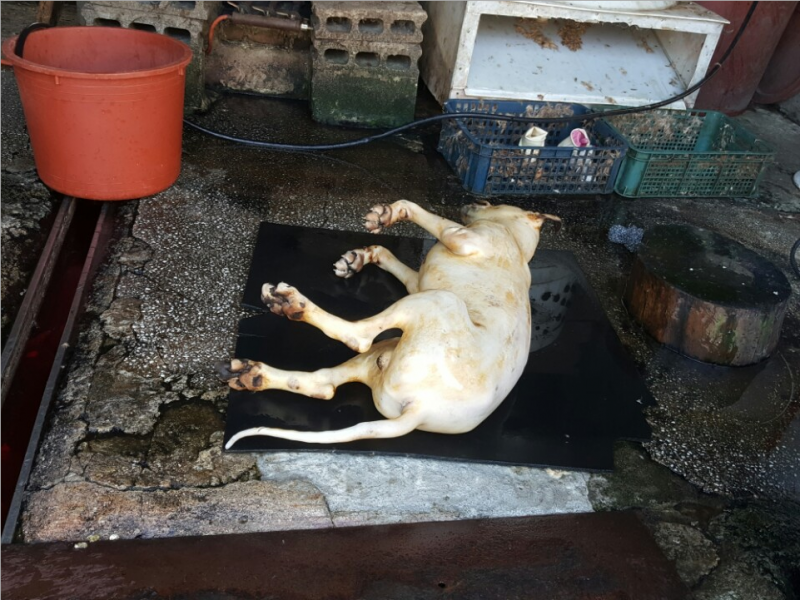 On August 12, ahead of ‘Malbok,’ the 3rd of 3 ‘Boknal’ Korean dog days of summer, Ulsan City officials and Busan KAPCA(Korea Alliance for the Prevention of Cruelty to Animals) conducted a joint inspection of this dog slaughterhouse and caught the butcher AOO with dogs bludgeoned with a hammer and knife stuck in their throats to bleed them to death in full and unobstructed view of other live dogs. At the time of the visit, Busan KAPCA reported that two dogs were lying on the ground bleeding profusely. One of the dogs was still alive and torturously gasping for breath. Pursuant to Article 8 of the Animal Protection Law, the act of killing an animal in front of other animals of the same species is subject to up to 1 year of imprisonment or a monetary fine of up to 10,000,000 Korean won. Accordingly, Busan KAPCA reported AOO to the police for the blatant violation of the Animal Protection Law. Until last year, businesses that slaughter and market a variety of livestock animals, including dogs, were prevalent in the old Sanggae-dong livestock market area. When the livestock market was closed down the number of slaughterhouses was significantly reduced. However, 6 dog slaughterhouses remain in operation, inflicting unbearable pain and suffering on these animals and selling their meat. 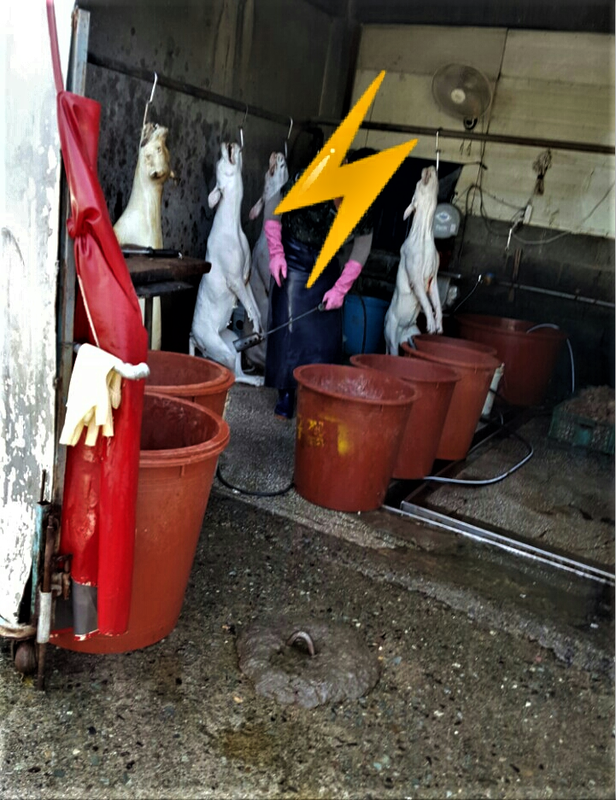 An Ulsan city representative stated that several years ago, local government over this jurisdiction conducted a broadscale maintenance, thereby eliminating the illegal dog slaughterhouse buildings. However, because the actual act of slaughtering dogs for the purpose of human consumption is not illegal, there are still people selling dog meat. How can humans be so cruel in their method of killing, it is bad enough that dogs are eaten for food, truly barbaric. No psychopath should have a say on the fate of animals or any life form. They are in abuse of office. We need to round up the psychopaths who are doing this to dogs and remove from and hold them to account. They are mass murdering criminals who should be executed. I have zero tolerance when it comes to sadistic crimes against animals Boycott all Korean goods, hit them in the pocket. All psychopaths care about is money. They have no empathy, no sensitivity and no moral conscience. This is despicable. Dogs are suffering a horrendously painful and unnecessary death because low life degenerate scum with poor to no frontal brain function do not know how to live on earth. Individuals who do this are the scum of th earth and should be removed. It is time to take action. Those behind this, who turn a blind eye must be exposed and Korea must be financially brought to its needs – that is the only way to wake these evil sadistic bastards up. Dogs should not be suffering in this manner. I am beyond being kind and respectful to degenerate murdering filth. Ann, I have never heard/read any other statement that sums up the Vile Dog Meat Trade any better than you have written, your comment clearly and concisely brings home the abhorrence, the cruelty and barbarity of innocent dogs who should be being looked after and cared for by the race known as human beings, not suffering torture and deaths of such brutality by human hands as they currently do! It is the evil barbarians who carry out this torture and murder that ought to suffer it themselves! Ann – I am in total agreement. I want people not to just read the news, watch the horrific videos (many of which I cannot even watch, and I have a strong stomach), and just make blanket statements but by raising awareness we can put on display what is truly going on, shed light on what is dark and hidden, and move people to act, sign petitions, give financially if possible, adopt a rescue from overseas if possible, and get legislators involved. I have zero tolerance for the sick behavior of torturing dogs and cats and come to remember that they will see punishment, in this life or the next. I agree with you. It is absolutely sickening and unforgivable the unimaginable heinous atrocities of torture and suffering these Korean monsters commit against such precious and intelligent dogs and cats. And the rotten and heartless Korean Government allows these unimaginable atrocities committed against the innocent dogs and cats to continue. I believe these animal torturing Korean monsters should be tortured by the vilest of heinous torture and suffering the same as their innocent and helpless victims endured. My hatred and detestation against these Korean animal torturing monsters and the Korean monsters that consume their battered and tortured bodies is deep within me. I just hate and despise them so much. And I really pray that they all die in horrific agony the same as their innocent victims and see how they like the agonising suffering until they take their last and final agonising vile breath. Down with South Korea and all their animal torturing and consuming monsters. Odporné, trestuhodné!!! Je potřeba to už zastavit!!! Jak je možné, že jsou lidi takový hrozný sadistický zrůdy!!! I think it is terrible putting dogs through this pain. I also hear that some of these dogs are stolen family pets. This needs to be stopped. Cruelly killed gives me a strong hatred towards those who carry this out. It has to be stopped and NOW! In my opinion why should pets be tortured to death to end up on a heartless bastards plate? I can only pray to God to change their lust for torture and consumption of tortured animals whuch were created to range free and be lived and taken good care of. The poor dogs the pain they go through is terrible and just think all these beautiful dogs all belong to people or some of them might be strays. This cruelty is been going on for too long please stop this before more dogs are killed alive. We need people like Richard Gere and big celebrities to do a film on this so that EVERYONE IN ALL COUNTRIES WATCH THE FILM INCLUDING THOSE IN CHINA AND KOREA AND ALL OF ASIA … And with every torture scene, stealing the dogs from homes or shops, then show the GOOD TREATMENT in a loving home, sleeping with the child, then a horrid scene, then a good scene where the dog alarms the family members that the house is on fire … a storyline for the GOOD and the evil reality storyline for the EVIL … EDUCATION EDUCATION EDUCATION AND SHAME SHAME SHAME SHAME …. IS THE ONLY WAY. More BILLBOARDS … more ADVERTISEMENTS ON BUSES … koreandogs.org is the best … support them!!! Janette.. best idea anyone has put forth to date. All the petitions in the world will not have the impact your suggestion would. This is horrible, but it also happens daily in the factory farming meat industry. Sentient feeling mammals like cows and horses, baby chicks, are dropped alive into steel grinders to be chewed up alive. Think about what you can do, where you live… purchase less or no meat, dairy and eggs. How can anyone be so cruel to innocent animals? Barbaric!! These people are not human. Please stop the cruelty now. Kill humanely if u must kill them. They are psychopaths to be able to do this to another living breathing animal. RIP poor little souls. SHAME ON YOU KOREA!!! How dare you treat dogs this cruel, heartless and sadistic way !! Dogs are our very best Friends and Family, they do so much for us. STOP THE TORTURE AND SLAUGHTER NOW, the WORLD is WATCHING YOU !!! We must boycott all products made in Korea, until these scumbags realize whole world is against their cruel behavior towards lovable dogs and cats. Let’s hurt these bastards where it’s painful : their thriving economy which could be on the decline as a punishment for their evil mind. YOU Barbaric Korea better STOP all dogs farm and dogs meat trade business! Shame on you! The world is watching all your evil deeds! Sono senza parole, inorridita e disgustata dall’indifferenza del popolo coreano che, tranne rare eccezioni, ha dimenticato cosa vuol dire avere una coscienza e un cuore. Il male o il bene compiuto ritorna sempre indietro secondo la legge di causa-effetto. Fermati Corea prima che sia troppo tardi! This lack of respect for life goes on far too much and to long. Look at the world out there. We have to start to make it better. No life deserves to be treated this way. It is disgusting. And it effects the reputation of this country, government, and people. This is so bad…so shame. So agony, desespair, pain…taking other life that way…just a horror. There are so much alternatives y doing that to the dogs? There are no arguments which can sustain this acts. Dogs gave there lifes to protect peopl and people do this to them? There is animal abuse all over the world but South Korea, China and most of the Asian countries have no laws against animal abuse. To torture and kill in the most barbaric ways are acceptable in these countries. Boycott all products made in these countries. I have never seen such animal cruelty as the dog meat trade. Totally appalling! Before, many great men as Abraham Lincoln, Gandhi, Victor Hugo, expressed themselves for the protection of the rights of animals!!! And their big sentences stayed in reports of people!!! But I see that now, nobody of the men in high places, worries about the life of animals!!! Victor Hugo said “hell for animals does not exist, they are there already” “which truth!!! It is hideous that the man manages to do things so horrible!!! Which chance that we have Nami Kim who fights against this horrible traffic !!! Stop buying any goods from them, boycott any and all Asian goods. The only thing that hurts these monsters is money. EVIL !! THEY MUST BE STOPPED ! NOT FIT TO BREATHE !